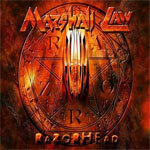 After a nine year hiatus, England's Marshall Law returns with 'Razorhead' - a heavy, in-your-face, traditional metal fist-pumper that is sure to get the blood flowing through every classic metalhead with a pulse. The band is most commonly compared to 'Painkiller'- era Judas Priest. Overall that is a pretty good comparison for the music, but don't expect any Rob Halford-like vocals from these guys. Singer Andy Pyke has a strong, mid-range voice, and although doesn't really sound like either of them, he is more of a Dio-type vocalist than Halford-type. At any rate, it is a really good fit for Marshall Law and this kind of classic metal.